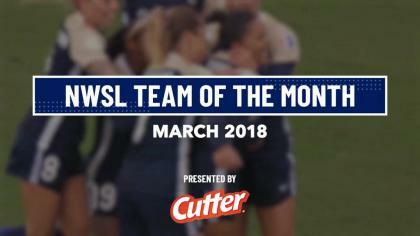 The North Carolina Courage improved to 5-0-1 with a 2-0 win over the Houston Dash at BBVA Compass Stadium in Houston, Texas, on Saturday afternoon to kick off Week 5 in the NWSL. Crystal Dunn got the Courage on the board in just the third minute with her third goal of the season. Following a long throw-in from Jessica McDonald that bounced in the box, Dunn hit it home to put the Courage up 1-0. McDonald nearly got a goal of her own in the 15th minute, but her header was tipped over the bar by Dash goalkeeper Jane Campbell for one of her five saves in the match. Kristen Hamilton scored three minutes into the second half, her first tally of the season. On a corner kick — one of seven in the game for North Carolina — the ball bounced outside of the box and was picked up by Hamilton after Denise O’Sullivan made a play for it. Hamilton struck it from 25 yards out and past Campbell to make it 2-0. Courage goalkeeper Sabrina D’Angelo made three saves to earn her fourth shutout of the season, including two on the same play as the ball bounced around in the box. The first, a fingertip save on a ball that went off the crossbar from Amber Brooks, and then a follow-up kick save on a point-blank shot from Nichelle Prince. Courage forward Lynn Williams appeared to hit defender Kristie Mewis in the face with a high kick on the play, but no foul was called. Dash defender Janine van Wyk recorded six blocked shots in the game, one more than Campbell’s total number of saves. She earned two on the same play in the 6th minute and also one in the 74th minute on a shot from well outside the box that appeared to hit her in the face. Dash forward Kealia Ohai started and played 61 minutes in her first start since tearing her ACL last year. She played her first minutes last week vs. the Pride. “We’ve given up a lot of goals on set pieces and when you go down one or two, it’s very difficult to come back from that. So we need to eliminate the goals on set pieces and then we can start to build from there,” Ohai told Dalen Cuff on Lifetime after the game. Dash midfielder Linda Motlhalo left in the 76th minute with what appeared to be an injury to her right lower leg. The Dash fell to 0-3-2 with the result and will next face Sky Blue FC on May 5. The Courage will host the Chicago Red Stars on May 6. Match ends, Houston Dash 0, North Carolina Courage 2. Second Half ends, Houston Dash 0, North Carolina Courage 2. Corner, North Carolina Courage. Conceded by Rachel Daly. Lynn Williams (North Carolina Courage) wins a free kick on the right wing. Attempt saved. Haley Hanson (Houston Dash) right footed shot from outside the box is saved in the centre of the goal. Offside, North Carolina Courage. Meredith Speck tries a through ball, but Lynn Williams is caught offside. Attempt missed. Lynn Williams (North Carolina Courage) right footed shot from the centre of the box is close, but misses to the right. Assisted by Crystal Dunn. Attempt missed. Kyah Simon (Houston Dash) right footed shot from the centre of the box is high and wide to the right. Assisted by Veronica Latsko. Attempt missed. Samantha Mewis (North Carolina Courage) left footed shot from outside the box is close, but misses to the right. Assisted by Merritt Mathias. Attempt missed. Samantha Mewis (North Carolina Courage) left footed shot from outside the box is too high. Assisted by McCall Zerboni. Offside, Houston Dash. Kristie Mewis tries a through ball, but Kimberly Keever is caught offside. Attempt saved. Lynn Williams (North Carolina Courage) right footed shot from outside the box is saved in the centre of the goal. Assisted by McCall Zerboni. Substitution, Houston Dash. Claire Falknor replaces Linda Motlhalo. Delay in match Linda Motlhalo (Houston Dash) because of an injury. Attempt blocked. Crystal Dunn (North Carolina Courage) right footed shot from outside the box is blocked. Assisted by Debinha. Attempt blocked. Merritt Mathias (North Carolina Courage) left footed shot from outside the box is blocked. Corner, North Carolina Courage. Conceded by Linda Motlhalo. Offside, Houston Dash. Rachel Daly tries a through ball, but Kimberly Keever is caught offside. Attempt missed. Debinha (North Carolina Courage) header from the centre of the box misses to the left. Assisted by Merritt Mathias with a cross. Corner, Houston Dash. Conceded by Jaelene Hinkle. Attempt missed. Veronica Latsko (Houston Dash) left footed shot from the centre of the box is high and wide to the left. Assisted by Kristie Mewis following a set piece situation. Substitution, Houston Dash. Veronica Latsko replaces Meleana Shim. Crystal Dunn (North Carolina Courage) hits the bar with a right footed shot from the centre of the box. Assisted by Samantha Mewis. Attempt saved. Debinha (North Carolina Courage) right footed shot from outside the box is saved in the top right corner. Assisted by Jaelene Hinkle. Substitution, North Carolina Courage. Debinha replaces Kristen Hamilton. Substitution, Houston Dash. Kimberly Keever replaces Kealia Ohai. Attempt missed. Jessica McDonald (North Carolina Courage) header from the centre of the box is high and wide to the left. Assisted by Lynn Williams with a cross. Attempt blocked. Crystal Dunn (North Carolina Courage) left footed shot from the centre of the box is blocked. Assisted by Kristen Hamilton. Goal! Houston Dash 0, North Carolina Courage 2. Kristen Hamilton (North Carolina Courage) right footed shot from outside the box to the bottom left corner. Assisted by Denise O'Sullivan. Corner, North Carolina Courage. Conceded by Haley Hanson. Attempt blocked. Crystal Dunn (North Carolina Courage) left footed shot from outside the box is blocked. Linda Motlhalo (Houston Dash) wins a free kick on the left wing. Second Half begins Houston Dash 0, North Carolina Courage 1. First Half ends, Houston Dash 0, North Carolina Courage 1. Jaelene Hinkle (North Carolina Courage) wins a free kick on the left wing. Merritt Mathias (North Carolina Courage) is shown the yellow card for a bad foul. Merritt Mathias (North Carolina Courage) wins a free kick in the defensive half. Attempt missed. Merritt Mathias (North Carolina Courage) left footed shot from outside the box is too high following a corner. Corner, North Carolina Courage. Conceded by Meleana Shim. Corner, North Carolina Courage. Conceded by Nichelle Prince. Corner, Houston Dash. Conceded by Abby Erceg. Attempt missed. Denise O'Sullivan (North Carolina Courage) right footed shot from outside the box misses to the left. Merritt Mathias (North Carolina Courage) wins a free kick on the right wing. Attempt saved. Nichelle Prince (Houston Dash) right footed shot from very close range is saved in the centre of the goal. Attempt saved. Amber Brooks (Houston Dash) header from the centre of the box is saved in the top centre of the goal. Corner, Houston Dash. Conceded by Abby Dahlkemper. Attempt blocked. Kristie Mewis (Houston Dash) left footed shot from the left side of the box is blocked. Assisted by Linda Motlhalo. Attempt saved. Denise O'Sullivan (North Carolina Courage) right footed shot from the right side of the box is saved in the centre of the goal. Assisted by Crystal Dunn. Attempt missed. Kristie Mewis (Houston Dash) header from the centre of the box misses to the left. Assisted by Rachel Daly following a set piece situation. Attempt missed. Crystal Dunn (North Carolina Courage) right footed shot from the centre of the box is too high. Assisted by Abby Dahlkemper following a corner. Corner, North Carolina Courage. Conceded by Jane Campbell. Corner, North Carolina Courage. Conceded by Amber Brooks. Attempt blocked. Lynn Williams (North Carolina Courage) right footed shot from the centre of the box is blocked. Assisted by Jessica McDonald. Attempt missed. Lynn Williams (North Carolina Courage) right footed shot from the centre of the box is high and wide to the right. Assisted by Jessica McDonald with a cross. Attempt saved. Kristen Hamilton (North Carolina Courage) right footed shot from the centre of the box is saved in the centre of the goal. Assisted by Lynn Williams. Attempt missed. 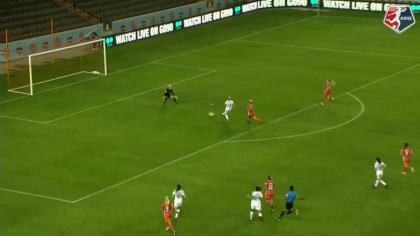 Kristie Mewis (Houston Dash) left footed shot from outside the box is too high from a direct free kick. Attempt blocked. Lynn Williams (North Carolina Courage) left footed shot from the centre of the box is blocked. Attempt blocked. Jessica McDonald (North Carolina Courage) right footed shot from the centre of the box is blocked. Assisted by Jaelene Hinkle with a cross. Attempt blocked. Denise O'Sullivan (North Carolina Courage) right footed shot from outside the box is blocked. Assisted by Crystal Dunn. Goal! Houston Dash 0, North Carolina Courage 1. Crystal Dunn (North Carolina Courage) right footed shot from the centre of the box to the bottom right corner. Assisted by Jessica McDonald.